This South African native sports a unique bloom shape that sets it apart from everything else you grow. 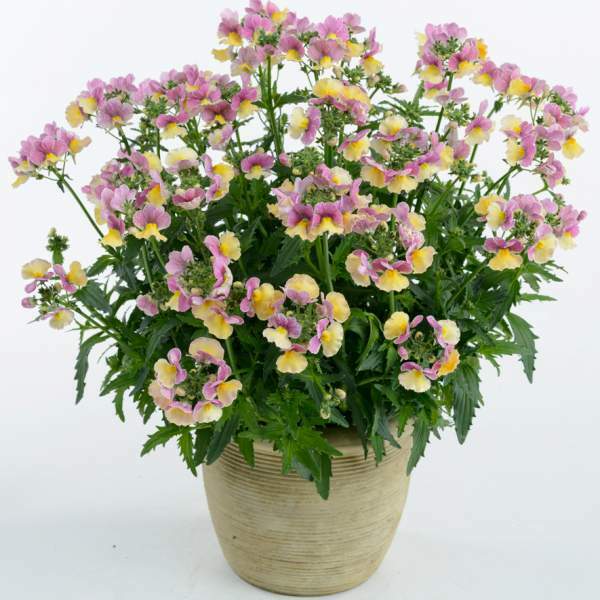 Nemesia perform well as outdoor garden plants and load up with multi-colored blooms sure to catch a customer’s eye. Grow them in small pots for a quick-turn product to pair with your pansies and other cool temperature landscape plants. Nemesia prefers moist, well-drained soil that's rich in organic matter with a balanced fertilizer and a constant feed program of 150-200 ppm N. Maintain a pH between 5.8 - 6.0. Optimal EC of 1.0 to 1.2. We recommend that you first pinch Nesia Banana Swirl 5-10 days after transplanting to your final container. Pinch early and soft to promote good basal branching. Nemesia should be spaced adequately to allow airflow and light penetration between the foliage. Use high light intensities to control growth. If needed, Danziger recommends the PGR B-9 3750 / Arest 10 ppm tank mix. Whiteflies, aphids, and thrips are the primary problem pests with Nemesia. Nesia Banana Swirl are not prone to many diseases, but watch for botrytis while the days are short. This grey rot is usually associated with wet or humid conditions. You can prevent botrytis by allowing the plant to dry out between waterings, allowing for good airflow in your greenhouse, and spacing to allow the sun to penetrate to the soil level. The most common chemicals used to treat botrytis are Medallion and Banrot. Use them as a drench according to each label’s instructions. We recommend planting 4-5 starter plants per 10 inch basket. Use a well-drained soil in your baskets and plant your starter plants deep, allowing the ellepot to be completely covered by the soil. If you are planting 4” pots, 1 plant per pot should be sufficient. Plant it directly in the middle of your pot. Pinch Nesia Banana Swirl 5-10 days after transplanting to your final container.